Last week we discovered that the 5-day forecast was calling for a week’s worth of blue skies and summer-like weather. Not bad considering this past Sunday marked the beginning of Fall. Now, don’t get me wrong, I do love fall. But, like many, there’s something about summer that just excites me like no other season. Maybe it’s that whole “school mentality” thing where we are all just programmed to believe that there’s an end to work once Memorial Day comes? I changed careers 3 years ago from a corporate Marketing job to a School Counseling job in the NYC Public School System so now I’m back to feeling like I did when I was 10 year old. No more pencils, no more books! No more teacher’s dirty looks!! Even as an professional, paid adult, there still are some teacher’s I can’t stand! Maybe I know that when summer begins, I can go “down the shore”. Anyone from Philly or NJ will know what I mean… we don’t say we’re “going to the beach” we always say we’re going “down the shore”. I am lucky to have family that owns a house down the shore, only about 4 houses from the beach. Summer to me means going to the shore. When we discovered the weather forecast, we decided that maybe our “summer ends after Labor Day” rule would be pushed aside. We loaded the car and headed “down the shore” with some of our cooking gear and ingredients. My mom and dad’s house isn’t very well-equipped with any type of cooking stuff. Our shore house is kind of a shack – a place where you don’t need to worry about washing the sand off your feet before you enter. A place where the oven broke 3 years ago and has never been fixed because you can always use the grill on the deck as your oven. The kind of place you may walk in and say, “eh, what’s all the hype about?” but then spend some time in and relax immediately. So with spices, a whole fish and our chef’s knife in tow, we headed south. Saturday night we decided to have a seafood fest with tapas recipes in mind. It was just the two of us eating, so it ended up being a bit more than the normal tapas portions. 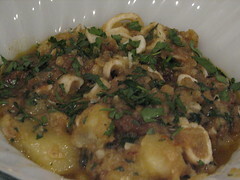 We started with a calamari and potato with lemon and wine tapas, moved on to a Portuguese-inspired littleneck clams with white wine and chorizo (using pan con tomate – grilled bread topped w/ garlic and tomato – to ‘shoop’ up the sauce) and finished with a whole fried snapper topped with a spicy parsley and garlic sauce. Saute your diced chorizo in your pot until they release some fat and take on a darker color. With a slotted spoon, remove chorizo and keep on the side for later. Using the rendered chorizo fat (you may need to add a bit more olive oil if necessary), saute your sliced onions until the absorb the color of the chorizo fat and are slightly translucent. Add minced garlic and saute for another minute. Add your white wine and simmer for 30 seconds. Add your stock and S&P (don’t add any more salt if the stock is salted already). Let simmer for about 5 minutes. Add the clams and put the lid on your pot. The clams should start to open after about 4 minutes. Remove lid and add back the chorizo bits. 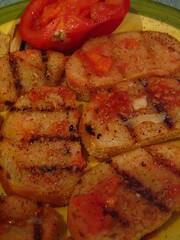 Sprinkle with your diced tomato and chopped parsley. Boil your new potatoes in salted water until soft – about 15 minutes. Heat up a good amount of olive oil (about 4 tablespoons) in a pan. When potatoes are tender, remove from water and put into the oil. Cook until they turn brown and crispy. NOTE: We wanted to use new pototoes, but instead used Yukon Gold. These potatoes were delish but the consistency of the dish changed…the yukon gold (due to it’s high starch content) created almost a bit of a chunky sauce. As the potatoes are browing, add your sliced onions and cook for about 7 minutes. Add your squid slices and cook for 2 minutes. Add your wine and cook for another minute. Mix everything together if you have not done so yet. Add your parsley, S&P and some lemon juice. Put your oil in your pot and start heating it (on high). With a sharp knife, make three diagonal slits (about 1/2 inch or so apart) on each side of the fish, deep enough to hit the bone (about 1 inch). This will help when eating the fish. Meanwhile, take your chopped parsley and your finely chopped garlic and mash it all together in your mortar and pestle (just mash it up a bit to release more of the flavors of the herb and garlic – do not make it into a paste). In a bowl, mix together your flour (add a pinch of salt and pepper) and water to make a batter. Feel free to add the water gradually and stir into the flour, adding more as needed. You don’t want a thin batter. Dip your whole fish into the batter and make sure the excess batter drips off. When the oil is hot enough, add the whole, batter fish and allow to fry until golden brown. Turn fish if not completely immersed in the oil. Probably takes between 6 to 9 minutes. When finished, take out and drain on paper towels. Take your parsely/garlic mixture and put in a small sautee pan with enough olive oil to make a sauce and gently heat through on low. This will allow the flavors to lightly infuse with the olive oil. Heat through for about 4 – 5 minutes. 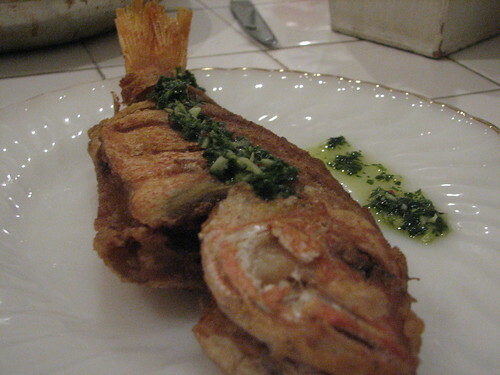 Plate your fish, squeeze some lemon juice on top of the fried fish then spoon on your warmed sauce. Enjoy! Cabrales Cheese – It’s a Bit of an Animal! 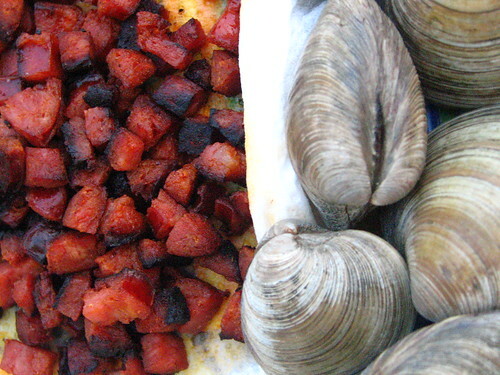 Those clams looks absolutely scrumptious! That is really something to bid adieu to summer with! Thanks so much, Ali! We really appreciate the shout-out on your link! 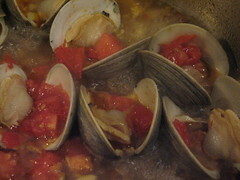 The Portuguese clams recipe is one of my faves. I making a point of cooking it whenever I can get good quality clams. Beats the old traditional mussels in garlic sauce you can get in any local supermarket in the UK. Much more flavoursome!